Google, a word which has no meaning in itself but has made the lives of a millions across the globe meaningful is the most frequently visited website of the worlds as per Alexa in the year 2012. Google reportedly for the year 2013 has generated revenue of $50 billion which reflects the size and success the company has reached over the time period of 15 years. Google is the creation of two brilliant minds named Larry page and Sergey Brin. 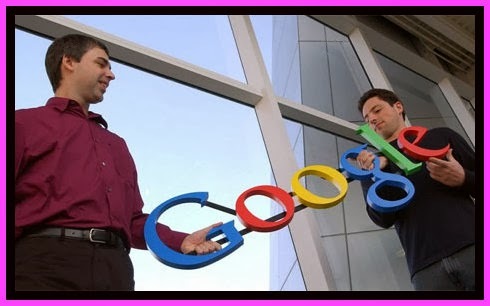 The story of Google and its founders is as extraordinary as its founders.It started in the year 1996 January as a part of a research project done by two gentlemen pursuing PhD from the University of Stanford, California. These two brilliant minds were Larry page and Sergey Brin. Partnership of these two coined the term Page Rank, which defined the importance of a website by the number of pages and the relevance of those pages linking back the original website.Initially the software was named ‘backrub’ by Page and Brin due to its property of testing backlinks in order to evaluate the relevance of a site. Larry Page,born as Lawrence Page was an extraordinary kids born of extraordinary parents. His father is the pioneer of Artificial Intelligence and Computer Sciences. He is from one of the few people responsible for the birth of the field of Computer Sciences. His mother was also a CS professor at Michigan State University. Interesting fact to know is about the inception of Google is the idea came as a dissertation topic for Larry’s PhD, so he decided to dig into the mathematical elements of the WWW and having a discernment about the structure of the link as a graph. Getting encouragement and guidance from his mentor Terry Winograd and with the partnership of Sergey Brin ‘backrub’ came into being and eventually Google was incepted over the time. Larry page was attracted to computers since he was six. He was the first student in his school to make an assignment through a word processor. He was inclined towards inventing things since his childhood. At the age of 12, he was sure he is going to start a company one day. Backrub started as a dissertation topic of Larry eventually made him build his crawler. Sergey Brin joined backrub not just because Backrub fascinated him but also because he liked Larry as a person a lot and was friends with him. Larry replaced Eric Schmidt as Google CEO in the year 2011. Larry page holds 16% of the Google share holding as well as is one the board of director of Google. Larry Page has invested with Tesla Motors, a philanthropic move towards renewable energy technology. In the year 2002 Larry Page was named as the World Economic Forum leader of tomorrow and along with Sergey Brin was named one of top 100 men as per MIT T100. He is 24th on the forbes list of billionaires and eleventh richest man of the word. Larry Page dated the present CEO of Yahoo Marissa Mayer when she worked for Google. He is married to Lucinda Southworth and is a father to two children. His vocal chords are paralysed due to a cold, reason which is not yet identified by doctors. The other Father of Google, one in a million genius named Sergey Brin was shoulder to shoulder with Larry Page in the journey of Google. He is friends with Larry and is a computer scientist and Internet Entrepreneur by profession. It was Brin’s data mining system which was used build the search engine which in future came out as Google. He was fellow PhD scholar with Larry Page at the Stanford University. Born in Moscow, but his family migrated from Russia when Sergey was just six due to the secondary treatment of Jews in Russia. He saw a very tough childhood. Most of his schooling was done at home with the help of his father, who is a mathematics professor at the University of Maryland. His PhD is on hold since the year 2008 at Stanford University. His net worth is $24.4 billion as of year 2013. Fifth most powerful man in the world along with Larry in the year 2009 by Forbes magazine. He predicted that in next five years robotic cars will be availed by general public. He separated from his wife in 2013 due to an extra marital affair.